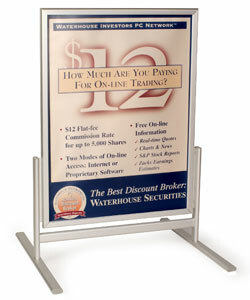 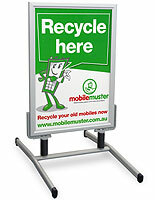 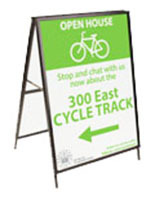 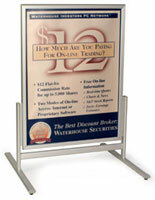 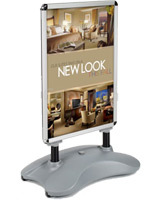 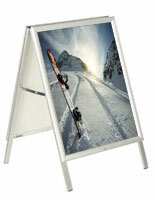 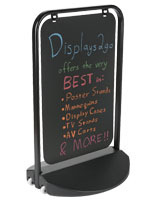 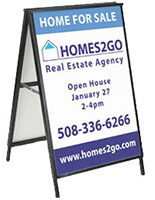 Why should you use sidewalk signs & floor standing posters in your business, retail store, or bar? 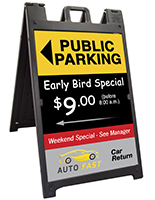 These A-frames & signage displays are some of the easiest and most affordable ways to advertise your business and bring in more customers. 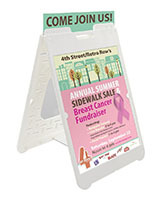 The sidewalk signs & floor standing posters for curb-side marketing are able to make passersby aware of your business on city streets or on concourses even though you are taking care of things inside your store. 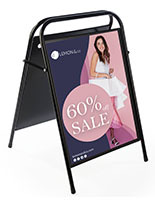 The sandwich boards make it easy to have changeable messages for different events that can be used daily or when different promotional offers start. 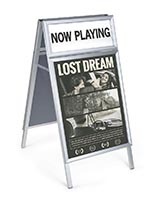 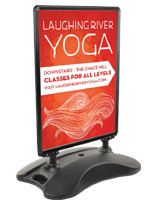 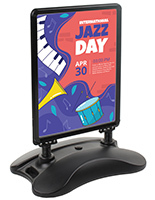 The sidewalk signs & floor standing posters, also called promotional image displays, may be made of plastic to be portable or have metal snap frames for even easier refreshing of custom graphics. 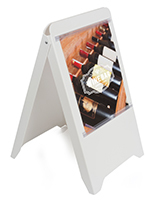 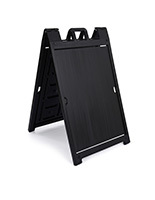 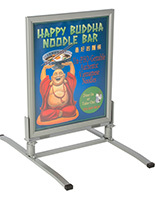 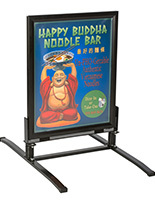 These commercial holders for signage are able to boost customer awareness of your bar or restaurant no matter in what city foot path they are placed. 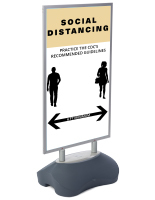 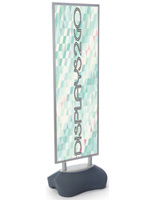 What are some of the distinguishing factors that are part of the changeable message displays? 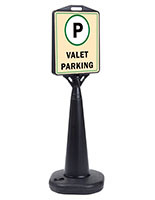 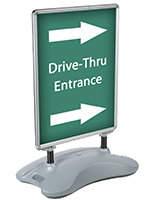 The signage holders for use outside can be metal or plastic for use with Coroplast® inserts or have PVC lenses to protect custom graphics. 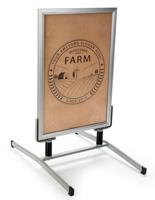 These displays may be portable A-frames that should come in during bad weather or could be snap frames with fillable bases to stay outdoors in wind. 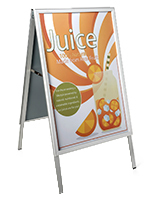 The signs & posters for indoor use are more traditional advertising. 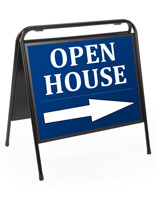 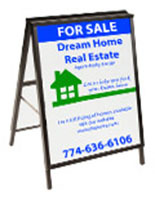 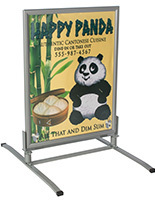 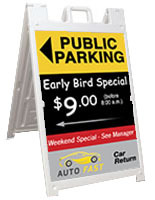 This signage could be acrylic frames, use PVC lenses, or display larger graphics. 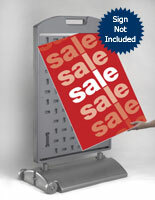 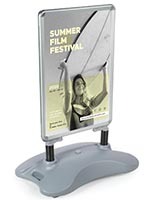 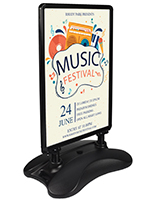 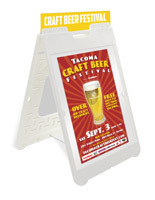 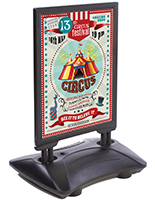 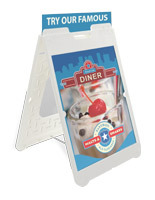 Some of these signs & posters are available with special bases that allow them to be placed directly with items and describe a promotional offer. 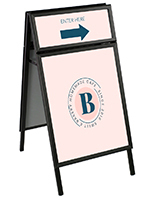 The sidewalk displays & floor standing signage can be used in many ways. 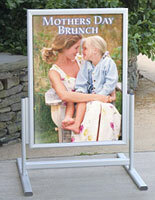 If driving in customers from the curb or city street is your goal, then outdoor A-frames may be the best option. 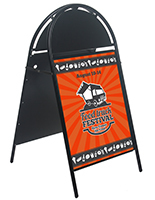 These sandwich boards are portable so that they can be brought inside overnight or during really bad weather and make it easy to change custom graphics. 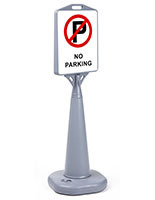 Bars, restaurants, or stores in a city with a thriving downtown area will place the plastic or metal signage next to the curb in front of their business and let it go to work. 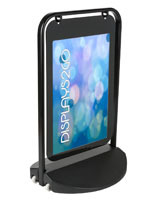 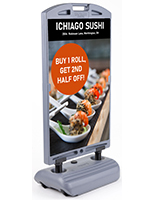 If your store is in a mall setting or you want to inform customers of promotional offers after they enter, indoor changeable message displays are for you. 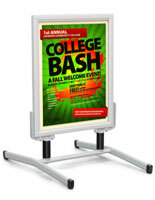 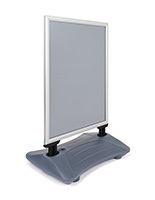 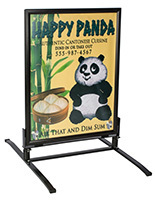 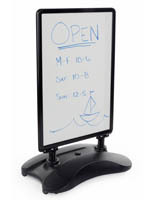 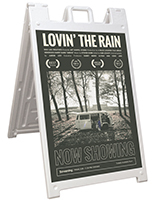 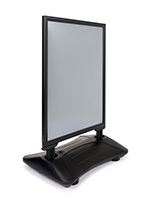 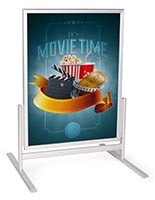 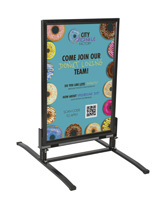 These frames will advertise items to customers in ways that are not able to be missed whether that is on a black we-erase board or using 36” x 24” images. 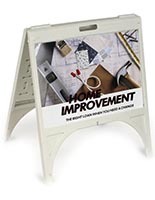 Of course, there is nothing that says the sidewalk displays & floor standing signage can’t be used in conjunction with one another to offer a complete marketing campaign to customers inside of your business and out.